The Swift S-1 is a polish performance acrobatic glider and was a follow on development of the SZD-21 which was banned from acrobatics after a wing collapsed at the world championship in 1989. A new and modern version of an acrobatic glider came to life which still had the excellent characteristics of the Kobuz 3. A total of 30 originals were built before the production stopped to make place for the production of the Fox. Today the molds dont exist any more so that a new production is unlikely. Tomahawk picked up the topic and created a fine replica of the original in a scale of 1:3,8. The model is fully made in a vacuum sandwich technology. The wing has a full carbon fibre structure and is covered with a glass fibre layer to ensure a smooth surface , the fuselage is made in glas-fibre and is reinforced with carbon-fibre in certain areas.. The model is capable to ustain high static and dynamic load. The size is still very comfortable for transport. 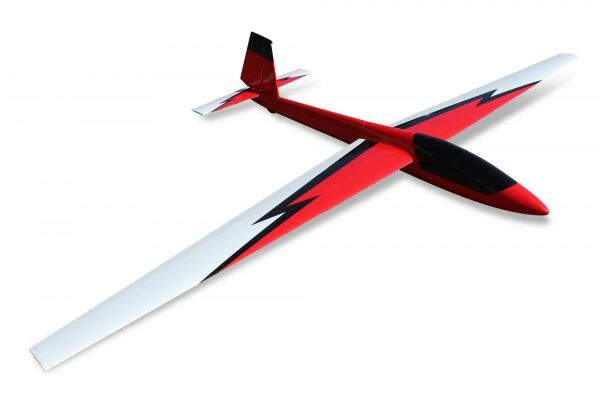 The model can be flown as pure glider or can be equpped with a nose motor or even samll EDF or turbines. Retractable Landing Gear for Swift 3,33 m Einziehfahrwerk aus Aluminium mit Servohalter, Rad und Radbügel. Passend zum Tomahawk Swift 3,33 m Retractable landing gear for the Tomahawk Swift 3,33 m with servo holder, wheel and wheel bracket. Swift 3,33 optional clear canopy without... Clear canopy for the Tomahawk Swift 3,3 m. When using this, the existing composite canopy wil be used as frame after making the cut-out. Related links to "Swift S-1 carbon 3,33 m full composite , painted"
Slingshot DLG 1,0m PnP , RH "red"
Slingshot DLG 1,0m PnP , LH "red"